Scared to negotiate your pay or negotiate for your dream role? Our first speaker event of 2018 is here! By high demand, this Lean In Auckland Chapter event is all about learning how to land that job and get paid what you're worth. We are hugely excited to welcome the gold award winner at the 2017 International Stevie Women In Business awards in New York, founder of SheProsperity and business coach who has been featured in the NZ Listener, Sunday Star Times, NZ Herald, M2Woman, Next Magazine, and Stuff, to name just a few. Kimberly Sumner coaches women in the corporate world with confidence and communicating their value in ways that feel authentic to them as women, so they step forward into roles they want, and paid their worth, without being labelled “bossy”, “greedy” or “demanding. Women come to Kimberly for help in negotiating for themselves, and for communicating their value (with promoting themselves authentically as women) for long-term career success. Kimberly’s early career started as an investment analyst with one of the world’s leading trading firms, (and later managing funds at an international funds management company), yet while she loved what she did she realised to get ahead she had to do business like a man. Leaving the corporate world, because she could not see how to connect authentically with herself as a woman alongside success, she built a successful business with her husband, later transitioning to help other women do the same. 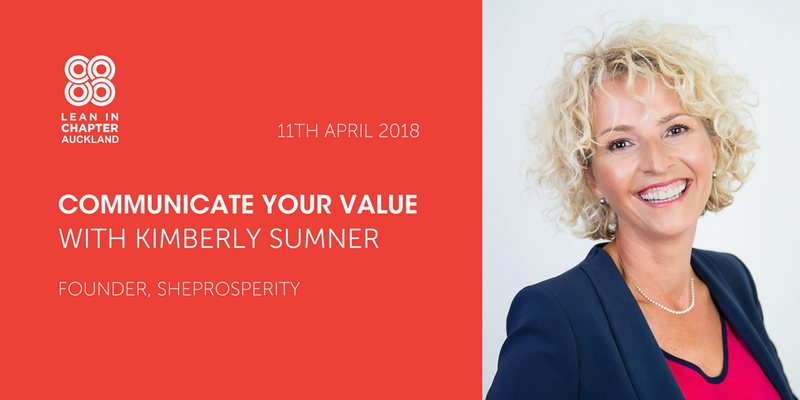 A mum to three teenagers, with a love for scuba diving and her book club, Kimberly founded She Prosperity in early 2017, continuing her mission to help women bring their value to the table authentically as women, driven by her deep desire to help women thrive in corporate roles and organisations outperform through diversity in leadership. We are delighted to invite you to an evening of drinks, canapés, and a masterclass in negotiating your value. Kimberly will take your questions at the end, sharing her wisdom and experience with the group.